Born 1972, lives and works in Copenhagen. After graduation from The Royal Danish Academy of Fine Arts - The School of Design in 1997 with additional studies at the University of Art and Design in Helsinki, Cecilie Manz founded her own studio in Copenhagen in 1998. Here, Cecilie Manz designs furniture, glass, lamps and related products, mainly for the home. In addition to her work with industrial products, her experimental prototypes and more sculptural one-offs make up an important part of her work and approach: “I view all my works as fragments of one big, ongoing story where the projects are often linked or related in terms of their idea, materials and aesthetics, across time and function. Some objects remain experiments or sculpted ideas, others are made more concrete and turn into functional tools. Recipient of the Thorvald Bindesbøll Medal 2011, the Bruno Mathsson Prize 2009, Kunstpreis Berlin 2008, the Finn Juhl Architectural Prize 2007, The Furniture Prize 2007, the Three-Year Working Grant from the Danish Arts Foundation and several other grants. Works with Fritz Hansen, B&O, Fredericia Furniture, Nils Holger Moormann, Lightyears, Holmegaard, Muuto, Georg Jensen Damask, Böwer, Kähler and others. 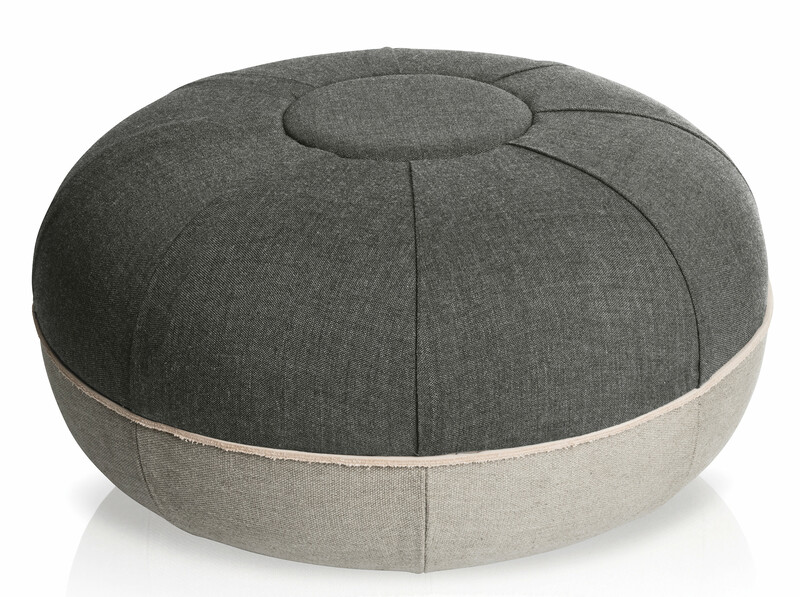 The poufs, designed by Cecilie Manz, invite nature in with a design reminiscent of naturally rounded stepping-stones and soft brooklet murmurs. Simultaneously functional and decorative, they add a sculptural element to everyday life, and are easy transformed into extra seats on festive occasions. Here, the materials are a subtle combination of the raw canvas used in Poul Kjærholm furniture and the classic Remix wool from Kvadrat, with a defining, unifying leather piping also found on Cecilie Manz’s Minuscule chairs. Materials Raw canvas, Remix fabric (Kvadrat), leather piping.